Existence Establishment is proud to present Noise Vision!!! We have already started integrating Noise Vision’s excellent live footage and video collages into the site, as footage can be found on our Northeast Noise and Power Electronics Festival II page and our Existence Establishment Web Launch page. Now Noise Vision is officially a part of Existence Establishment and has it’s own permanent home in our Webzine section. We’ve already kicked things off with a recent video of Brendan Murray, Perispirit, Xela – Live at the Piano Factory. Following, is a brief synopsis of what Noisevision is all about by the sole proprietor and operator Adrian Montes. Noise Vision, as it exists, began as a free form blog intended to include a wide variety of live performances, documentaries, photos, flyers, etc. which generally fall under the banner of noise. It quickly dissolved or evolved into a stand alone blog limited to live performances captured by myself in both Los Angeles, my former residence, and Boston, my current. It is my intent to return to that original idea at Existence Establishment and use this platform to include not only videos captured by myself, but to encompass all imagery relating to noise, and other not so noisy genres. 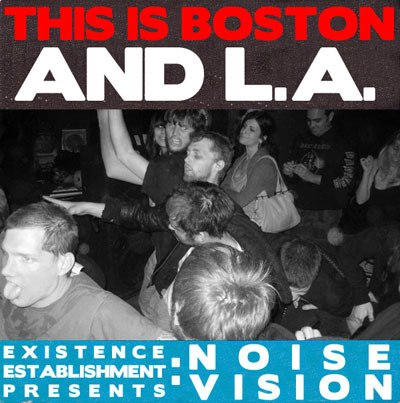 Noise Vision has released two DVD’s featuring performances in both Los Angeles and Boston. Smog Vision, currently out of print, includes performances from Yellow Tears, Infinite Body, Jason Crumer, Robedoor, Moment Trigger, Tusco Terror, Persimmons Pomegranate, and God Willing. Karlheinz “And This is How I Live My Life” is solely concentrated on New England’s Noise/Power Electronics wrecking machine Karlheinz and is still available. For more information click here.